MemTest86 test versus Ryzen 2700X base and boost clocks. I have been testing Corsair Vengeance Pro RGB Ram on a Ryzen 2700X build. I need to verify that the installed memory passes MemTest86 with any given BIOS settings and memory clock timings before booting into a Windows 10 OS drive. I have already discovered the danger of just setting predefined XMP profile and booting into Windows OS without running MemTest86 and ensuring it passes with Ryzen 2700x and X470 motherboard. It results in a totally corrupted OS and required reinstall of Windows 10. This leads to the following question. Which frequency multiplier should I set to test Memtest86 assuming single BCLK of 100MHz? Should I run MemTest86 at 4.3 GHz i.e multiplier in BIOS = 43 to ensure that MemTest86 passes at Max Boost Clock 4.3GHz ? Should MemTest86 be able to pass at both conditions? Has anyone on this forum tested these conditions? I understand that MemTest86, running with 8core/16thread on supported tests only tells me if I should be able to boot into Windows 10 Pro safely. Once in Windows 10 Pro though additional operations such as running a GPU benchmark or other applications could cause more power supply noise which could cause memory errors. 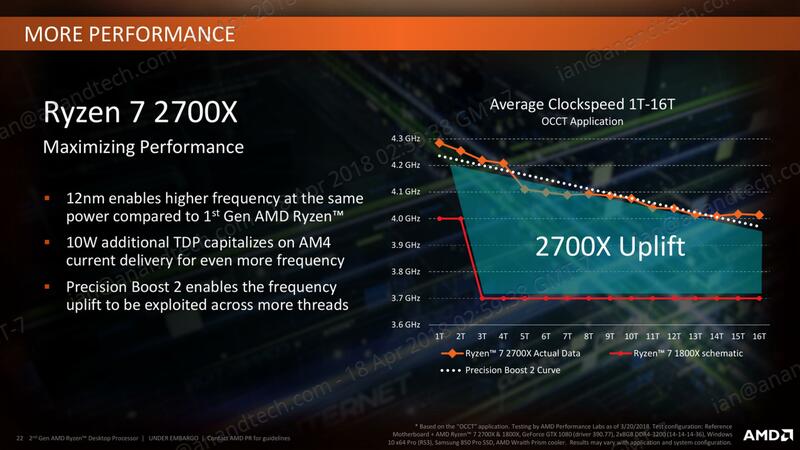 It looks like Ryzen 2700X will run mostly at the at the Base Clock 3.7GHz. with all 8 cores and 16 threads running. So I should probably tune to be as stable as possible with most margin to fail at 3.7GHz for normal operation and still pass MemTest86 at Max Boost Clock 4.3GHz condition, but have less margin to fail at that condition. Precision Boost 2 when enabled in BIOS should only boost to higher clock speeds in conditions where fewer CPU threads are running. It looks like even running Ryzen with Precision Boost 2 enabled in BIOS will barely hit 4.3GHz on a single Thread anyhow. Apart from Precision Boost there is also the option to turn on SenseMI in BIOS. That might increase the core frequency the CPU runs at but I will go with the assumption that SenseMI was on by default when AMD produced the above slide. Did you use a particular program to test Memory Stability once in Windows 10? Do you mean Windows itself or is there something you want to block from running at startup? I usually just go to Task Manager -> Start-up Tab and disable everything I can there. If there are other programs still running at start up they usually have an option to prevent launch at start up somewhere in settings. Anything else then likely a virus or sometimes a Windows 10 process just decides to hog the CPU doing something I cannot control. Everything seems to be spyware, use a packet sniffer and you will see. Most loaded items like MSI Afterburner check for updates. Other programs check license servers. Some other system tray items are for audio and networking, the MSI Live Update checks weekly or as desired. Skype does a lot of crap given its free, so I have to wonder what is up. I have a license for Avid and it has some very extreme DRM attached mostly due to the high cost for the tools.